Come hither to the historic seaport of Harwich and witness the medieval* spectacle of sausage throwing, as grown men and women try to hurl seasoned pork projectiles as far as they can. Following on from this fabulous frivolity, three fantastic local inns throw open their doors for the gathered masses to test the wares of the finest butchers of the Tendring Hundred and determine the public's favourite sausage, all washed down with the choicest real ales and ciders. * might not actually be true. Warnes Butchers of Dovercourt and Parkeston win the innovation Class with the New Bell in second place. The Butchers Class was won by Becky's Butchers of Great Bromley, which was a pork and leek recipe, with Chas Bower Butchers of Holland-on-Sea in second place and Smiths Butchers of Brightlingsea in third. Becky is our Overall Champion for 2018 and will be put forward for the national Champion of Champions competition in 2019. The throwing competition was won by current sausage throwing champion Todd Rothwell lobbing for the Alma Inn with his first throw of 152 feet and 6 inches. Second was James throwing for Warnes Butchers with a throw of 129 feet. 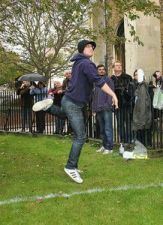 Third was Mark throwing for Shaws Farm Meats of Dovercourt Market with a throw of 122 feet and 6 inches. This means that the Harwich sausage throwing record stands at 157 feet - set my champion lobber Todd in 2017. This is how we roll - there may be slight variations due to enjoyment and downright tastiness. We changed things slightly in 2016 by dividing the field into two classes. The Butchers' Challenge is open to butchers and the sausages entered must be available for sale in a retail outlet for at least three months in the year following the festival. The Innovation Challenge is open to all food producers and the recipe can be a one-off special for the festival. Producers may enter sausages into either or both categories and the competition will be a blind tasting of all sausages from both classes. When the results are announced the highest scoring sausage in each class will be announced along with the overall winner. Our overall champion goes forward to the Champion of Champions Sausage Competition. Participating butchers will be listed nearer the time so watch this space for details. The winner of the throwing competition in 2017 was Todd Rothwell chucking for the Alma Inn of Harwich with a new Harwich Sausage Throwing record of 157 feet. This beat Harwich Sausage Throwing legend Nick Aldridge's previous record of 150 feet 6 inches which he set in 2014. The overall winner of the 2017 tasting competition was Primrose Pork of Great Bromley with their awesome Pork and Cranberry sausage. Somewhere around 2008 at a beer festival planning meeting someone came up with the idea of a sausage throwing competition, we can't be sure who it was or exactly when it was suggested but it resurfaced year after year until 2011 when we decided that it simply had to be done in order to get it off the agenda! The Producers' Throwing Competition commences at 11.00 with some warming up (of participants, not sausages) before each contender throws a "standard" raw sausage as far as they can. The event is held next to the Hanover Inn in Harwich and is taken very seriously with a deal great of athleticism, psychology and giggling. A cricket umpire adjudicates to prevent cheating and Tendring CAMRA "Sausage Marshals" carefully measure and record each throw. Once the throwing competition is complete the action moves to three traditional pubs - the Alma Inn, the Hanover Inn and the New Bell Inn where the sausages will be ready for the public to taste over the next couple of hours. Each pub will have supplies of some of the anonymous sausages and a supply of voting slips. Members of the public are invited to tour the pubs, sampling sausages and soaking up the atmosphere. For a vote to qualify all the sausages must be scored and the fully completed voting slip returned via one of the boxes made available at the pubs. When the competition ends at 14.30 the votes are collected and counted in the New Bell Inn (aka "Sausage HQ") where the winner will be announced at 15.00. If you love the atmosphere of the Great British pub and are partial to a gourmet sausage we warmly invite you to join us. Even if you're not entirely sure we would welcome the opportunity to convince you that the combined talents of butchers, brewers and publicans makes for a fantastic day out! There is no charge to watch the throwing or join the public sausage tasting but we respectfully ask that you buy drinks and perhaps some food as you visit the pubs. The butchers have donated their delectable produce free of charge so if you like what you taste please seek out and support them! If you're travelling from away it's really easy to come along to Old Harwich by public transport and sample some sausages whilst enjoying a couple of beers. Both Harwich Town railway station and bus station are within a couple of minute's stroll of the Hanover Inn and the start of the festival and all the pubs can easily be reached on foot in a short circuit of the old town.